Berlin. 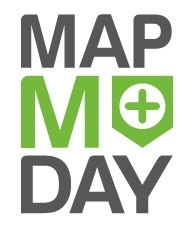 September 27 marks the start of the second edition of the worldwide campaign “MapMyDay”. The goal this time: to raise awareness of the barriers that people experience when they are on vacation and travelling. The German NGO Sozialhelden and the non-profit asociation European Network for Accessible Tourism (ENAT) are calling upon people everywhere to rate the wheelchair accessibility of places that are of interest to tourists, using the online map Wheelmap.org. The occasion for this worldwide event is World Tourism Day 2016. Steps, stairs and broken elevators – barriers that many people can easily overcome, can prove to be insurmountable obstacles for people in a wheelchair, with a walking aid and for families with a baby carriage. These barriers are even more of a hindrance for people travelling to a new place where the surroundings bring on a lot of questions: Which hotel or vacation rentals are accessible? Where can I go shopping for groceries with my wheelchair? Which tourist sites are accessible without steps? The German NGO Sozialhelden found an answer to these kinds of questions by developing the online map Wheelmap.org, an interactive city map where everyone can see if a public place is accessible for wheelchair users or not. It is a worldwide map which gives valuable answers to everyone who is planning a vacation abroad or a short trip to another city. In the course of the last six years, volunteers around the world have marked nearly 700,000 places on the map and approximately 500 newly marked places are added every day. On September 27, Sozialhelden will kick off the second campaign of “MapMyDay” with the aim of making more people aware of the problems steps cause for people everywhere and how they limit their plans for traveling and vacation. With the event, the NGO in Berlin joins in on this year’s theme for World Tourism Day, “Tourism for All”. “On this World Tourism Day, let us recognize that all people can and should be able to participate in tourism and enjoy unforgettable travel experiences”, explains UN Secretary-General Ban Ki-Moon. The first edition of the worldwide mapping event in December 2015 was very successful – people marked more than 20,000 places within the three weeks before Christmas. “We want to build on the great results from last year and motivate people around the world to become part of the movement in a second round. Leisure and travelling are areas of life where freedom and self determination are expressed more than in any other areas in modern society. On the occasion of World Tourism Day, we want to advocate for accessible tourism because people with mobility impairments are still confronted with a dire lack of accessible sites, accommodation and destinations”, is how Raúl Krauthausen, founder of Sozialhelden and creator of Wheelmap.org, explains the campaign’s goal. “Wherever you are in the world, you can make a contribution by identifying places with good access quickly and easily with this clever app. Make your mark for humankind and show your accessible tourism sites and services on World Tourism Day. We are counting on you”, says Ivor Ambrose, Managing Director of ENAT. The Sozialhelden hope that many more businesses, institutions and individuals will join in again and spread the word about the campaign. Also partners and participants are once again invited to share their experiences on social media using the hashtag #MapMyDay. The nonprofit organisation Sozialhelden is a group of activists who have been developing creative projects since 2004, to call attention to social problems and to eliminate them in the best of cases. Innovative ideas and a healthy dose of humour have proven to be a very successful mix. The team from Berlin has received many awards including the Deutsche Engagementpreis, the Deutsche Bürgerpreis, the World Summit Award and the Smart Accessibility Award.